My people were kinda outcasts and rebels. Half white, half black children living in always ablaze Lower East Side—that’s how they made room for all those condos peeps. Then we were pioneers in the heroin infested jungles of Brooklyn. We believed in peace, women’s rights, black power and health food. My mom’s babies didn’t drink milk unless it was Tiger’s milk—what the hell’s Tiger’s Milk? We drank rivers of Red Cheek apple juice and ate wheat germ—what the hell’s wheat germ? Is it even gluten free? We ate pumpkin bread. It probably had wheat germ in it, along with the GASP!!! Whole Wheat Flour!! !—what the hell’s whole wheat? We escaped Drop Dead New York City for the wilds of the Catskills every summer, where walked barefoot, on the hot, rocky road, in our cutoff Levis with ecology patches sewn on the pockets. We played with the off-spring of the initially pleasant, but small worldly and subsequently racist Italian and Irish blue collar bungalow colony families on our little road in Copake Lake—what the hell’s a racist? We didn’t notice until we were told, by a visiting six year old cousin of the family across the road—no doubt sporting a “Kiss Me, I’m Italian” tee shirt over her bathing suit—that we couldn’t swim in the pool, the one we’d been swimming in for years, because we’d make the water turn black. That one stung. We had afros, were raised by lesbians—my mom’s bestie jumped the fence, traveled in a black Mustang convertible and later a Japanese orange Toyota jeep. Yeah, we cooked out of the Vegetarian Epicure and we ate pumpkin bread—homemade by my mom. I don’t think we were categorically hippies, but we certainly looked like ones. The folks in the bungalow colony could tolerate a lot of things from us, but maybe they couldn’t hack women in leather hot pants kissing each other? People camping out in our 1/4 acre back yard. Or was it all the pot smoking and tripping with the Beatles blasting out of our hi-fi? Or our dog, Bags, chasing their kid’s mini bikes? In their native habitat, the hippie has been offer a loaf of pumpkin bread as a gift of good neighborliness in the hopes of building a rainbow bridge of peace and harmony, but it couldn’t fix that. Eventually, we became “personas non grata” with their kids. We moved to Vermont, near the impoverished town of North Adams, Massachusetts. We were SHOCKED and disoriented by seeing poor white people en masse—what they hell were poor white people? The mill workers lived in these ramshackle wooden houses and apartment buildings, along the highway, that looked like they’d collapse like a house of cards if you turned your head as fast as theirs whipped around when we barreled past in the Japanese orange Toyota jeep packed with white women and brown children. I don’t recall if the mill was closed, but it seemed there wasn’t much going on except a trip to the McDonalds—that was a THRILL and a childhood treat for us—I believe the burgers were fifty nine cents. I wonder if they made them out of actual meat in the early days? We’d never experience white trash as they would no doubt have been called by more sophisticated people than us. Seasoned by life on the Lower East Side, we were accustomed to poor people of color and maybe even poor hippie white people, but we were scared by these overweight folks who stared at us through hollowed eyes and sneered at us through missing teeth. It was a little like a scene from Boardwalk Empire. All eyes were on us kids at the Stamford General Store, as if they expected us to steal something. We knew better than to live up to their expectations. Vermont came with a lot more nature—40 acres with a stream—but no other kids, since the houses were very far apart. So we played with each other and cooked and baked bread, whole wheat bread and no doubt pumpkin. The 70’s were a funny time food wise. 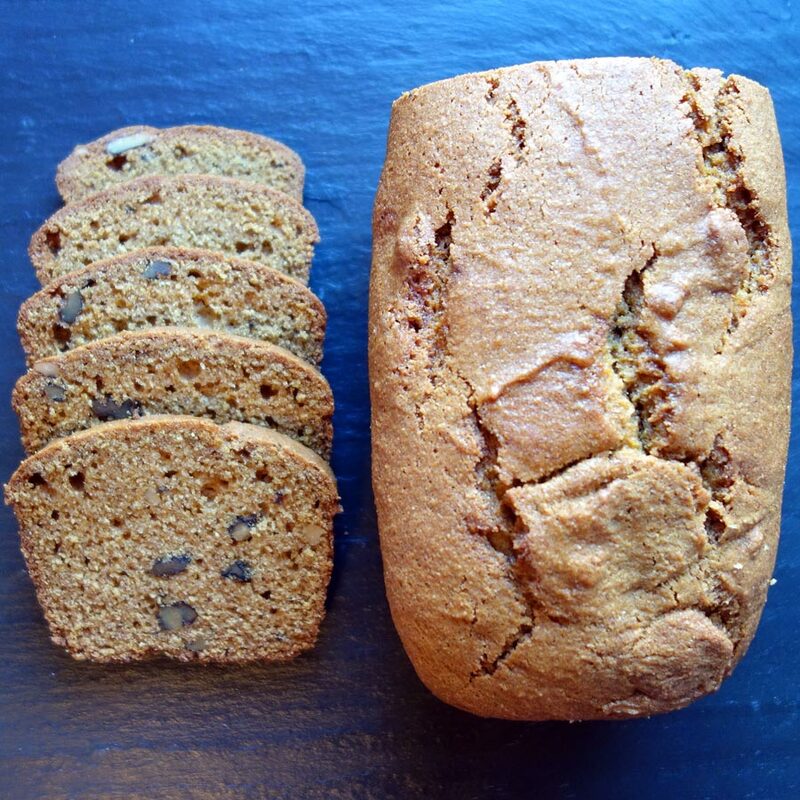 As a pseudo-hippy kid, making bread out of pumpkin seemed revolutionary and wild until I heard of zucchini bread. The only time we had pumpkin was in pie at Thanksgiving and I hated it. My mother would bake this bread fairly often and all the other ingredients masked the nasty flavor of canned pumpkin that I still loathe today.One Christmas we baked them as gifts in old coffee cans, as you did back then. It was our way of recycling and being environmentally conscious. If you make this, use roasted or steamed sugar pumpkin, butternut squash, calabaza or another dense pumpkin as the base. It’s worth the extra work. Grease and flour two 9’ x 4 1/2” loaf pans. In a large bowl, mix together whole-wheat flour, sugar, salt, baking soda, nutmeg, cinnamon, cloves and set aside. In a medium-sized bowl, beat eggs with oil until smooth, then add the pumpkin . Mix wet ingredients into dry ingredients until just incorporated. Do not over mix. Bake for one hour, until toothpick inserted in center comes out clean. Use roasted or steamed sugar pumpkin, butternut squash, calabaza or another dense pumpkin as the base. It’s worth the extra work. If you want make it fancier, add chopped walnuts or pecans, pumpkin seeds, raisins and-or cranberries or any other dried fruit you like. The pseudo hippies would’ve have put sunflower seeds in it. Today’s modern hippy with no doubt add flax or chia seeds. If you do add nuts or fruit remember to sprinkle some on top to make it more attractive. You can bake this recipe into coffee cans, muffin tins, ramekins or any shape you want.